What most listeners probably haven’t spent much time pondering is that soul’s place in the universe. On his adventurous new album, In The Key Of The Universe, the master organist turns his musical attentions to his spiritual side, tapping into a strain of metaphysical jazz that’s fueled sonic searchers for more than half a century. Joey D calls upon disciples and missionaries of jazz to join him in paving the way to enlightenment. 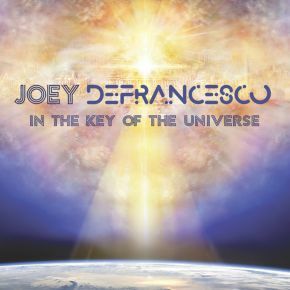 An artist who's always been deeply attuned to the full history of jazz and able to tap into it in innovative ways, DeFrancesco naturally feels a profound connection to the questing, devotional jazz of forebears from Pharaoh Sanders to John Coltrane to John McLaughlin. It may seem like a change in direction, but unexpected travels into new territory has been a central tenet of DeFrancesco’s music throughout his remarkable career.